I hope everyone is having a great weekend! Did you shop on Black Friday? I did not, but I did end up at the mall yesterday to take Bryan to the skate park. Matt is in town from NYC and we took him over there to see Bry skate. I had Matt bring his camera home so we could take some photos and maybe make a couple videos! He has a Canon 7D-it's amazing and I am totally jealous! We took a couple pics of Bry skating and some video too. I also took some pics of a couple projects and i plan to make a scrap video or two. Here is a mini album I have been reunited with! 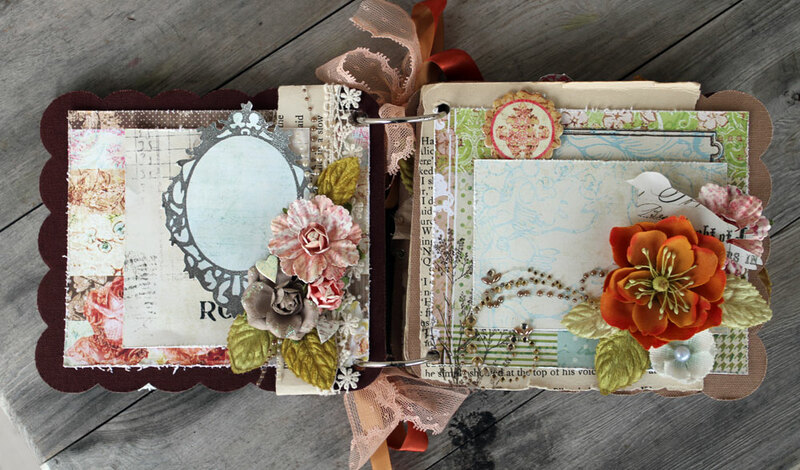 I made this for CHA Winter 2010 for the release of our Canvas Build A Books. They kept it for some shows to display. I made it literally right before I went to the show so I never took any pics of it. Now that it's home, I photographed it so I could share it here. And I used Matt's camera-they came out pretty good. 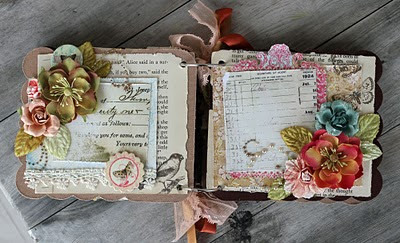 I mixed some old book paper with Prima's Shabby Chic and Raspberry Tea collections. 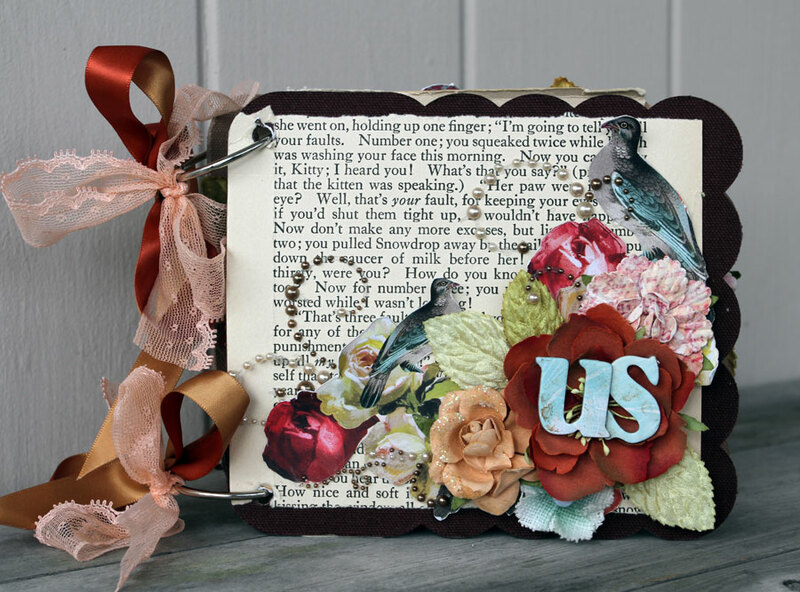 I cut out some images-the birds and roses, then mixed them in with flowers, velvet leaves and pearl swirls. The chip letters were Glimmer Misted with Walnut Gold and placed in the flower center. I added an unusual color combo of ribbons to the book rings-but they work with my color scheme. Burnt orange and light pink. The first two pages inside: I layered some patterned papers with more book paper. I stamped the frame and and label on patterned papers then cut them out to use as a page accents. I added a mix of flowers that match the soft color scheme. I think it adds more interest when you add bolder colors to the mix as long as they don't overpower the pages. Here I added more bold flowers with lots of paper layering. I cut out some of the images from the patterned paper, added chipboard elements with cream lace and more gold crystal swirls. 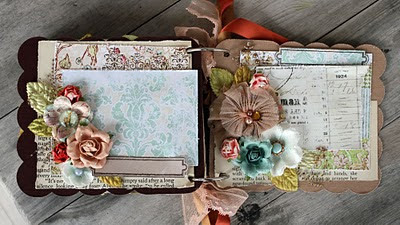 I aslo stamped the bird on the left page, bottom right corner and some butterflies above the flower cluster on the right. Here are the last two pages with more stamped labels, paper layering and flower clusters. A little bit of bold color tucked in there with velvet leaves and bling. All of the paper edges throughout the album are distressed and I sprayed Walnut Gold Glimmer Mist very lightly over all of the pages for a subtle aged look. I am so happy to finally share this mini with everyone-I hope it inspires you to create one of your own! I have another I have been reunited with, so I plan to share that one soon! Enjoy the rest of your weekend! I hope it's a creative one! Has everyone adjusted to daylight savings time yet? 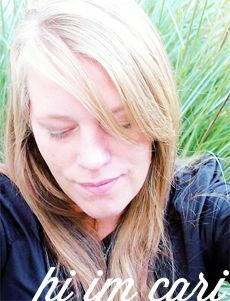 I have finally-just yesterday but I am still a little off with it getting dark out so early. I am making dinner earlier now because of it and it seems strange to have that extra time at night after dinner is over. With extra time on my hands, I took Bryan to Target last night for feetie pajamas! He loves them and his feeties from last year are a little small. Not to mention the holes that have appeared in the feet. I laugh at the fact that he still insists on wearing them long after the toddler years have passed. The High schooler that was working the register at Target said he loved his feetie pj's for the longest time and now owns a Snuggie because he misses them-LOL! I couldn't believe he confessed such a thing to a total stranger (because-as we all know-teens are too cool to talk to Mom's let alone their love for feetie pajamas and now snuggies). But I guess some boys will always be little boys at heart. I have some seasonal cards I want to share with you. Some are more involved than others, but they are all easy to recreate if you plan to make several for this time of year to send out to loved ones. I made some of them recently and some are from past seasons that I still love... I will try my best to explain the techniques used to create these cards as well as the exact products so you can give them a try. This first card is one of my all time favorites. I used an acrylic set from Sassafrass Lass. The deer is so adorable and I really love their images. I used Adirondack Dye inks-Lettuce, Terra Cotta and Espresso. The sentiment is from Hero Arts and the rest is Sassafrass Lass. The ribbon is from Creative Impressions-love that dot ribbon! All cardstock is from Bazzill. Punch two holes in the card crease and run the ribbon through it. The tree branch and the deer are stamped slightly off the card front. This next card is such a fun Christmas card to make. I used Prima felt-the trees come in a long stirp where you get five on a strip. I peeled off the backing to expose the adhesive, and loaded it with silver glitter. Then I attached the felt piece with Fabri Tac to the card front. 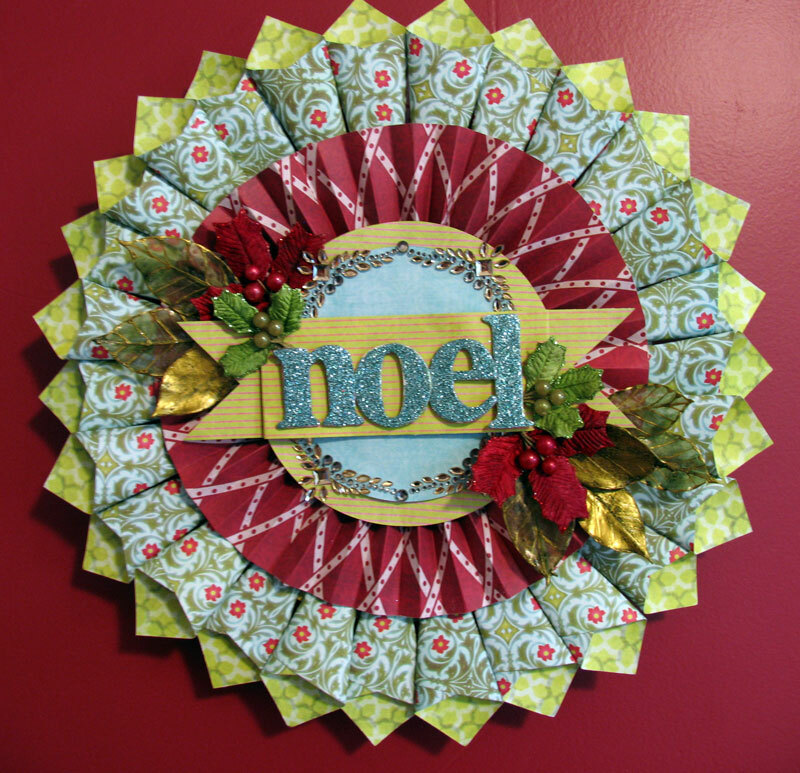 I used Christmas Fancy paper and green lace (cut down the center length wise) from Prima. I cut a long cardstock strip and knotched out the ends. 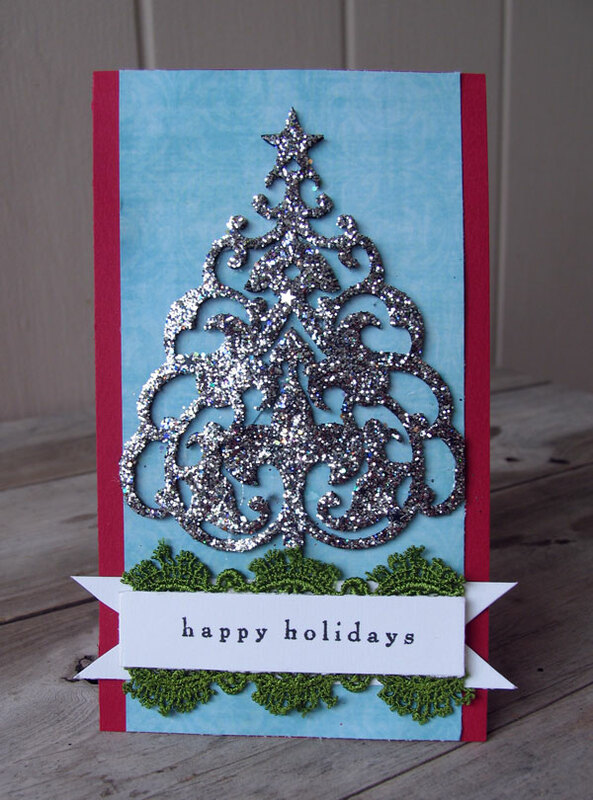 Then I stamped a sentiment on a rectangular piece of cardstock and I tucked the lace behind the top and bottom of the strip-then adhered to the card below the tree. Sorry for the crappy photo of this card :P I love this one and had to share because it is so easy to make several of these. I can always tuck a photo of the boys on the inside with a nicely written note. All of the stamps used on this card are from Amuse Art Stamps. They are cling mounted rubber stamps-you get the quality of stamping with Red Rubber and the ease of seeing where you are stamping when mounted on a clear block. Apply Shabby Shutters and Peeled paint ditress inks to the holly-light to dark color wise. You always want to add the lighter color first. Stamp off the card front on the top left. If there are areas that did not take the ink well-take a waterbrush or a small brush dipped in water and smooth out the ink in the areas that need color filled in. If you ever stamp and there is an area that is missing ink-that is a sure way to fill in with color. You can also take the brush direct to the ink pad to pick up more color to fill in too. Stamp the sentiment and berries with Ladybug Memento ink-a nice red-and add red stickles to the berries. I will try to post a better photo of this card. Here is an easy fall card that I just love! The pumpkins and sentiment are from A Muse Art stamps. The pumpkins are a clear set that come with Jack O Lantern faces to stamp over the pumpkin images. But in this case-I just wanted the pumpkins. I applied Spiced Marmalade and Rusty Hinge distress inks to the pumpkins and then added peeled paint to the stems. I applied the ink pad direct to the stamps. I stamped the pumpkins slightly overlapping one another. Then punch out with a 2inch circle punch from MArvy. 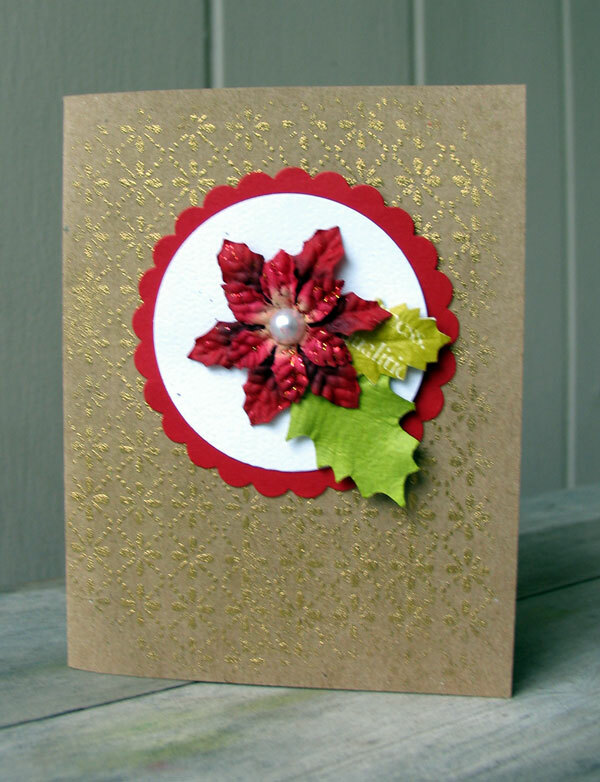 Then a scalloped punch from green cardstock. Adhere the two circles together using foam tape. 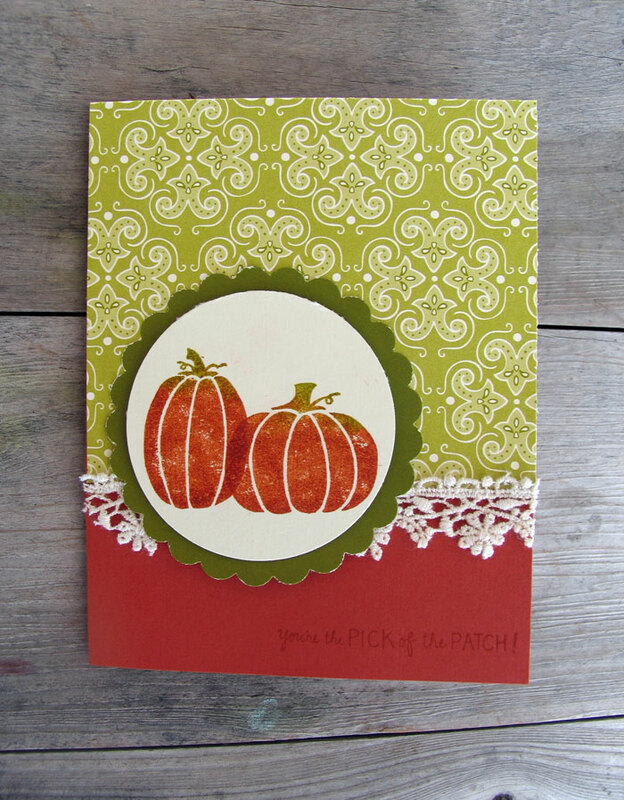 Apply the green patterned paper from A Muse onto the orange card font. Adhere the lace across where the orange and green meet, stamp sentiment on lower right of card and then apply the prepared circles. 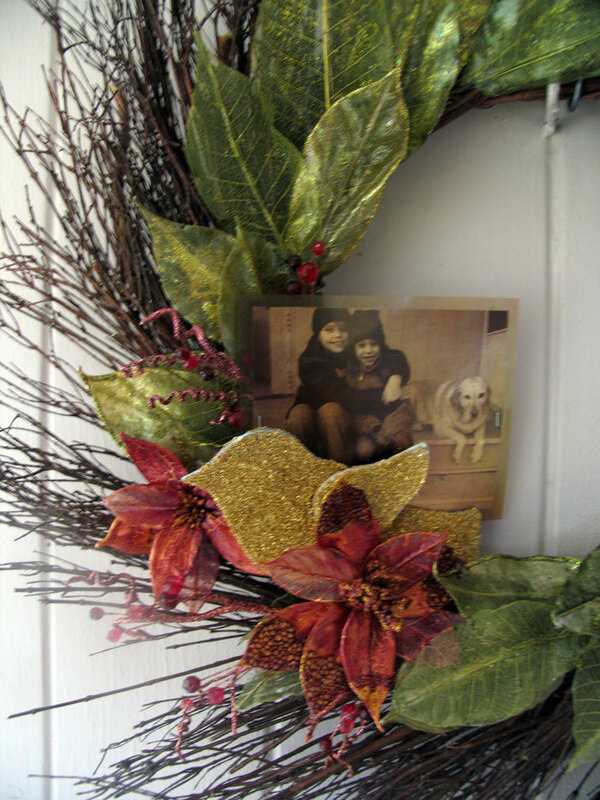 I used a dark orange for the sentiment but I recommend using Walnut Stain or Vintage photo Distress Ink for it instead. 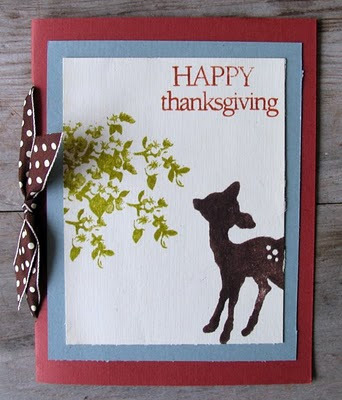 Here is another fun card to create! 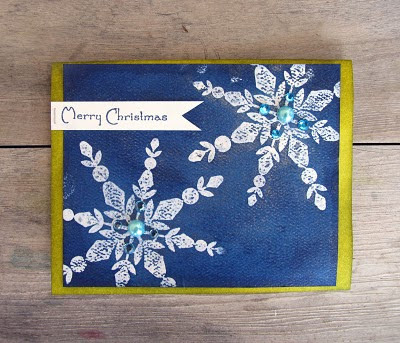 Stamps on this card are also from A Muse Art Stamps-the large snowflake and the sentiment. Cut out a rectangle of heavier cardstock or watercolor paper. I used some scraps from my leftover Paintable paper from Prima. 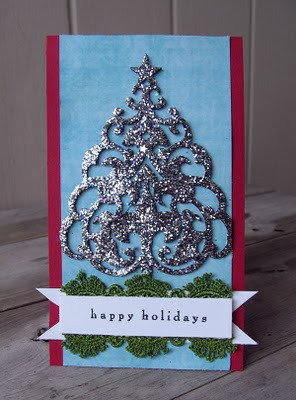 Stamp the snowflake twice using Distress Emboss ink, then sprinkle with clear or white embossing powder. Tap off the excess powder in a tray or coffee filter, heat set. I stamped off the image on the top right and lower left of the card. Now-the image will act as a resist once the embossing is done. Take Distress inks-Tumbled Glass, Broken China and Chipped Sapphire and apply over the snowflakes. 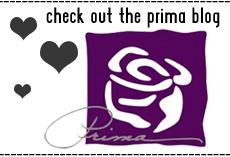 You can use your foam distress tool or apply the ink pad direct to paper. Start light to dark with ink colors. There is a slight variation in colors once they are all applied and the technique works perfectly leaving you with white snowflakes! 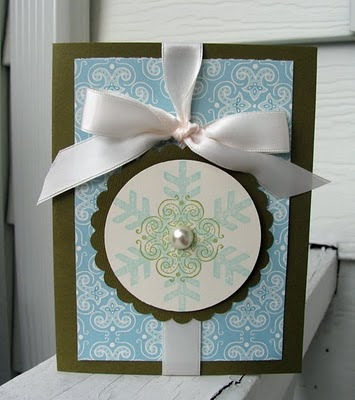 Add Prima E-Line pearls to the snowflake centers and then staple you sentiment at the top left of the card front. I stamped the sentiment with Chipped Sapphire. 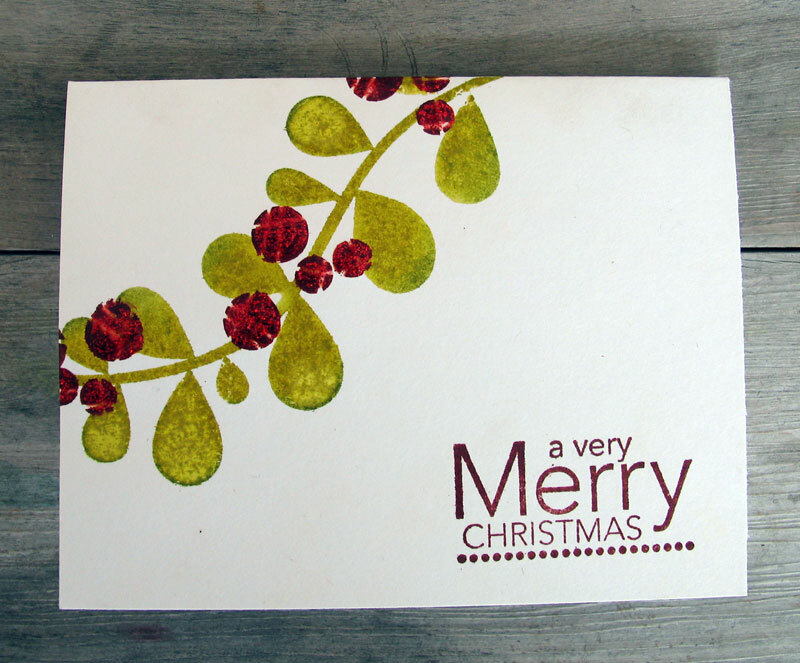 Adhere to green cardstock-or....take white cardstock card base and apply Crushed Olive Distress ink to the outer edges (direct to paper or with ink blending tool, and adhere snowflake piece to the card front. Then finish off the card with Dazzling Diamonds or Irredescent Gold Glimmer Mist-light mist! This next card is so easy and it has a store bought look! Create a card base from Olive colored cardstock. Adhere A Muse patterned paper to the center-I cut it 5in x 3 3/4in, tie a white ribbon around the card and finish with a bow. Stamp a large snowflake using Versafine Chalk ink-Sea Breeze on cream cardstock, then A Muse Madeira stamp in Versa Tea Leaves over the center of the snowflake-then punch out with Marvy circle punch. The snowflake stamp I used is no longer available BUT-Hero Arts just came out with a snowflake cling set that will work great! Punch out a scalloped circle from same color olive cardstock and adhere both circles together. Adhere over the ribbon and add a pearl to the center. The ribbon is a basic silky ribbon I found rolls of in the dollar ribbon bin at Michaels. This last card is another easy and fun card to make. I stamped the background with a Hero Arts background stamp called Dots and Flowers. I inked it up with Distress embossing ink-then removed some of the ink from the outer edges of the stamp. 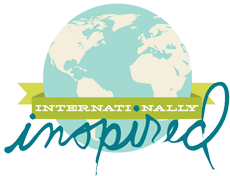 Aplly the stamp to Kraft colored cardstock, sprinkle with fine gold emboss powder by Ranger, tap off excess and heat set. Punch out two circles using Marvy punches from white and red cardstock-and adhere together. Then Adhere two layers of Poinsettia flowers with leaves. Add a pearl to the flower center. 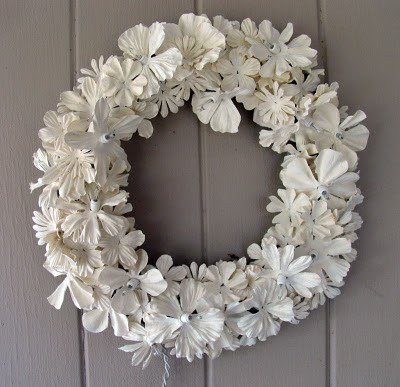 The flowers can be found in a round tin at Michaels-they include leaves too. Use a coupon if you want and you have a fabulous tin after they are all gone. I hope you liked this segment on cards! 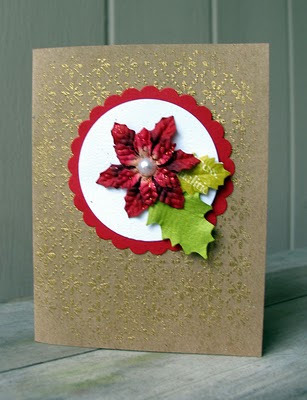 I have many more card ideas to share with you that are easy and fast for the holidays, so be sure to check back soon!